Actress Gillian Anderson has been made patron of the fund behind the UK's first statue of Charles Dickens, which is due to be unveiled later this year. The £140,000 monument will stand in Portsmouth where Dickens was born. It was due to be unveiled in 2012 to mark 200 years since the writer's birth, but insufficient funding meant it was put on hold. Another £25,000 still needs to be found and it is hoped Anderson will help spearhead the final fundraising push. 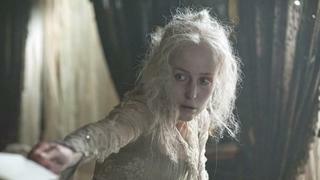 The actress played Miss Havisham in the BBC's adaptation of Great Expectations and Lady Dedlock in Bleak House. She said: "I was surprised that there wasn't a Dickens statue anywhere in Great Britain. "One especially in Portsmouth, where he was born, would be a focal point to expand people's knowledge of and interest in Dickens and his writing." The rest of the money has been raised by the Charles Dickens Statue Fund. The statue is set to be unveiled in Portsmouth's Guildhall Square later this year. It shows Dickens reading in a chair and is being made by Oxford sculptor Martin Jennings. In his will, the Victorian author requested that no statues or monuments of him should be built. However, Dickens has two known statues in his honour, in Philadelphia in the US and Sydney, Australia. There are not believed to be any in the UK. The Oliver Twist creator was born in Portsmouth on 7 February 1812 and spent the first three years of his life in the city before moving to London and then Kent. Number 1 Mile End Terrace, where he was born, has been a dedicated Dickens museum since 1904. Anderson was recently confirmed as the lead role in BBC drama series The Fall, which launches later this year.